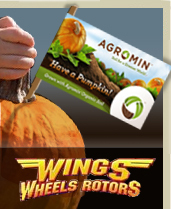 Agromin Blog: Pick Up a Free Pumpkin at Agromin's Booth at Wings, Wheels & Rotors! Pick Up a Free Pumpkin at Agromin's Booth at Wings, Wheels & Rotors! Agromin is excited to be a Silver Sponsor of the 10th Annual Wings, Wheels & Rotors Exposition at the Joint Forces Training Base in Los Alamitos. The date is Sunday, October 23, 9 a.m. to 4 p.m. Admission is free. Stop by our booth to pick up a free pumpkin. We will be located right next to Kids' Korner. For more than 30 years, Agromin has created earth-friendly soil products for farmers, landscapers and gardeners. Agromin is also the organics recycler for over 50 Southern California communities. Each month, Agromin receives tons of organic material and then uses a safe, natural and sustainable process to transform the material into premium soil products such as mulches and organic potting soil. More than six tons of pumpkins were given away at the 2010 WWR Expo. The pumpkins were all grown using Agromin organic soil. The expo is produced by the Joint Forces Training Base, Los Alamitos and Los Alamitos Area Chamber of Commerce. On display will be military aircraft, helicopters ,many cars,warbirds along with public safety, first responder and military equipment. Aircraft flyovers are planned including aircraft static displays. For more information, got to www.wwrexpo.net.